A training manager recently called me to talk about empowerment. She explained employees often worked in silos, and didn't reach out to collaborate with other teams. When there was an issue that required inter-departmental work, employees would just dump it on their supervisor. The training manager had been tasked with finding an external trainer to help. She found me after watching one of my training courses on Lynda.com. Unfortunately, I quickly discovered the team wasn't ready for training. This is really a common situation—leaders send their employees to training too early, and they don't get the results they want. Here's how I determined that from a short conversation, and here's how it can be fixed. You may have had a big bowl of candy once the dust settled on Halloween. It's a big temptation. You know you aren't supposed to eat the candy, but it's right there. Staring at you. Tempting you. I’m not going to lie—I ate way too much candy. The knowledge that you shouldn't eat the candy can be gained by training. But it's your environment, i.e. the candy bowl in plain site, that tempts you to eat some anyway. The solution is to change the environment. Remove the candy bowl and you will eat less candy. The customer service team in the training manager's company faced a similar environmental challenge. Whenever employees would bring a challenge to their supervisor, the supervisor would simply take on the challenge. She never spent time showing employees how to handle these issues. After awhile, employees embraced the inevitable and just dumped work on their supervisor whenever they could, knowing that's what would happen anyway. I walked through this with the training manager. She laughed a bit and admitted the last time they had brought in an external trainer, the training had been well-received by it didn't stick. The supervisor had always been too busy to help her team develop their new skills. Here's the takeaway that applies to all of us: if you want training to stick, you must first adjust the environment and get leaders fully plugged in. There's a model that can help you address this issue. 10 percent came from formal training. The word "rule" implies it's hard and fast science, but it's really more of a guide. While originally derived from leadership training, it's a good model to follow for other training topics. Even if we sent them to a terrific training program, two factors would quickly override anything they learned. The boss (~20 percent of learning) would continue taking challenging assignments (~70 percent of learning) off their plate. Game over. Now imagine what would happen if we could adjust the environment and got the supervisor to buy-in to some new behaviors. Here's how that might fit into the 70-20-10 model. 70 percent: Employees are asked to work through challenges. 20 percent: The supervisor coaches employees through challenges. 10 percent: Employees are given training on internal customer service. In this scenario, the training and the environment (daily work + boss) are all aligned. 70 percent: What challenges present learning opportunities? 20 percent: How can you guide them as their leader? 10 percent: What helpful skills can employees learn in training? Employee training has some big problems. It's a big expense. There's the cost of hiring a trainer and developing the materials. You have to pay employees to attend. Many companies have to run overtime to backfill shifts while staff attends a class. That investment might be worthwhile if the training worked. It often doesn't. There are many reasons why training doesn't stick. Managers are often too busy to prepare employees for training or coach them through implementing new skills afterwards. The training itself may be poorly designed. Or employees may not be fully bought in. There are many situations where another solution is more appropriate. My own analysis suggests that training only accounts for one percent of customer service employees' performance. The best solution to all of this is to train employees when they need to be trained and not train them when training isn't an appropriate solution. Knowledge: the employee lacks sufficient knowledge. Skill: the employee lacks sufficient skill. Ability: the employee lacks sufficient ability. So the only time that training is an effective solution is when employees have gaps in one or more of these areas. Some people ask me about the distinction between skill and ability. Skill is the technique involved while ability is a combination of natural talent and skill. Imagine a warehouse worker lifting products onto a shelf. Skill is the technique the worker uses to lift products safely. Ability is how much the worker can actually lift. The worker can lift heavier weights through training, though there's a limit to how high that weight can go due to the worker's natural ability. Here are three training requests I have actually received. Read each request and determine whether you think training might be an appropriate solution. The answers are in the video below. Scenario 1: A small department is having a hard time working together because two senior employees create an uncomfortable work environment. Will team building training fix the problem? Scenario 2: Employees don’t know how to use the organization’s new computer system. Will computer training fix the problem? Scenario 3: Employees can’t keep up with their workload due to a staffing shortage. Will time management training fix the problem? Watch this short training video to learn the answers. You'll get to see a group of people from a live train-the-trainer class discussing each scenario before I finally reveal the answers. The short video was from my online course, How to Design and Deliver Training Programs. The course is available on Lynda.com and LinkedIn Learning. You can get a 30-day Lynda trial here. You may also want to explore alternatives to training. Here's a handy seven-step action plan. Finally, check out one of the classic training books, Telling Ain't Training, by Harold Stolovitch and Erica Keeps. This book has been one of my go-to resources for many years. I'm a bit behind on listening to podcasts. For instance, I've just finished episode 91 of Crack the Customer Code, a wonderful podcast hosted by Adam Toporek and Jeannie Walters. The current episode is #255. Ironically, the title of episode 91 is "How to Find Time for Training." One of the topics Adam and Jeannie discussed was restaurants and retailers like Chipotle and Starbucks that shut down the entire operation to conduct employee training. As Adam points out in the episode, "That's great for a reset," but shutting down the entire business for training is more of a statement than a long-term solution. And many smaller businesses may find it too economically difficult to close down completely. Trying to train employees while the business continues to run can be an exercise in creative scheduling and challenging logistics. It's difficult, but not impossible. Here's what you can do. Many leaders mistakenly believe the challenge is figuring out how long the training should be, who should deliver the training, and when can it be scheduled. This approach neglects one key decision: what training do you actually need? My analysis suggests that training often addresses just one percent of the problem's root cause! Why worry about how long the training should be if it's such a small part of the issue? Can you use voice of customer feedback to improve common problems? Do customers have access to self-help solutions to simple issues? Are employees empowered to resolve typical complaints? Training won't address any of those. Now, imagine you first implemented some solutions. You reduced product defects, beefed up self-help, and empowered employees with better policies and procedures to serve their customers. You might still need training, but now you'd need a lot less. A client once asked me to conduct training to help its call center employees sound more friendly over the phone. I did some research and spent just a little time talking to the employees. It turned out the call center was severely understaffed several times during the week and wait times expanded up to 30 minutes. The employees sounded curt because they were in a hurry to get to the next customer! I was able to help the client solve the problem just be reconfiguring the schedule so staffing levels better matched call volume. This solution eliminated much of the wait time and employees were more relaxed. The employees suddenly sounded a lot friendlier and we didn't do any training at all. 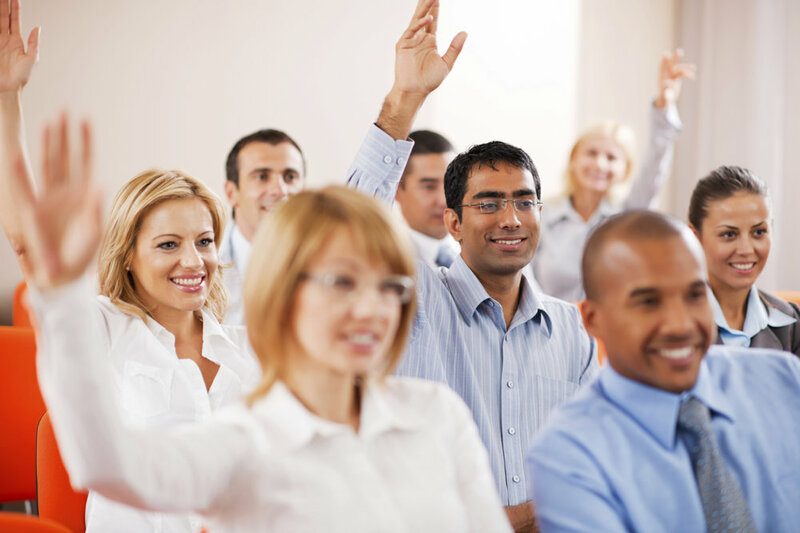 When most people think of training, they imagine a formal class such as a live workshop or an e-learning program. The 70-20-10 rule, based on research from the Center for Creative Leadership, tells us this just scratches the surface of how our employees learn. The rule was originally intended as a rough guideline for leadership training. It can easily be adapted to other training topics such as customer service. Look at those percentages again. They tell us that generally speaking, roughly 90 percent of training (70: challenging assignments + 20: boss or mentor) is already happening to some degree. You just need a way to guide it. You can save time by leveraging video in many cases. Here's one example where you can use video to reduce training time by 75 percent! I've also assembled these simple training plans to help you blend experience, mentorship, and formal training into an effective training program takes less than one hour per week. A lack of time isn't a great excuse for not training your employees. You can make training work if you do it efficiently. Ditch the old content-heavy, classroom-only training model and adopt a new approach that puts the focus where it belongs: getting results! Over the past two months, I posted a couple of training plans that customer service leaders can use to train their teams. The idea was to provide a low-cost alternative to hiring an expensive customer service trainer. These plans are designed to be cost-effective and easy to use. The first was called Serving Upset Customers 101, which focused on helping customer service reps learn the basics of defusing an angry or upset customer. The second was called Serving Upset Customers: Eliminating Repeat Service Failures. This training plan showed customer service teams how to learn from angry customers to avoid repeated issues. This training plan is the third in the three-part series. It's called Serving Upset Customers: Preventing Customer Anger. The best way to handle an upset customer is to prevent that customer from getting upset in the first place. Ask participants to watch the short training video, Creating Personal Relationships (2m 29s), before attending the first meeting. This video is part of the Working with Upset Customers course. Discuss ways that personal relationships can prevent customer anger. Exercise: Experiment with rapport-building techniques to create personal connections with customers. Watch video: Avoiding Unpleasant Surprises (2m 51s). Exercise: Download the Expectation Management Worksheet exercise file. Use it to identify situations where you can help customers avoid unpleasant surprises. Discuss the results of the using rapport-building techniques exercise. Discuss the results of the avoiding unpleasant surprises exercise. Watch video: Replacing Trigger Words (4m 43s). Exercise: Identify a situation where you can use the pre-emptive acknowledgement technique. Discuss the results of the Pre-Emptive Acknowledgement Technique exercise. Brainstorm common trigger words and more effective replacements.